Record-breaking warmer and fresher water in Puget Sound. May-June conditions are more unusual than last year. Recent rain brought river flows close to normal but water exchange in Puget Sound remains weak due to low Fraser River flow. Phytoplankton blooms and organic material are visible in some areas of Central and South Sound but not in others. Noctiluca, while absent in Central Basin, was reported in unusual places. Jelly fish occur only in some south sound bays. Follow our BEACH program kick off, discover the Stinkworm, and find good underwater visibility for diving. 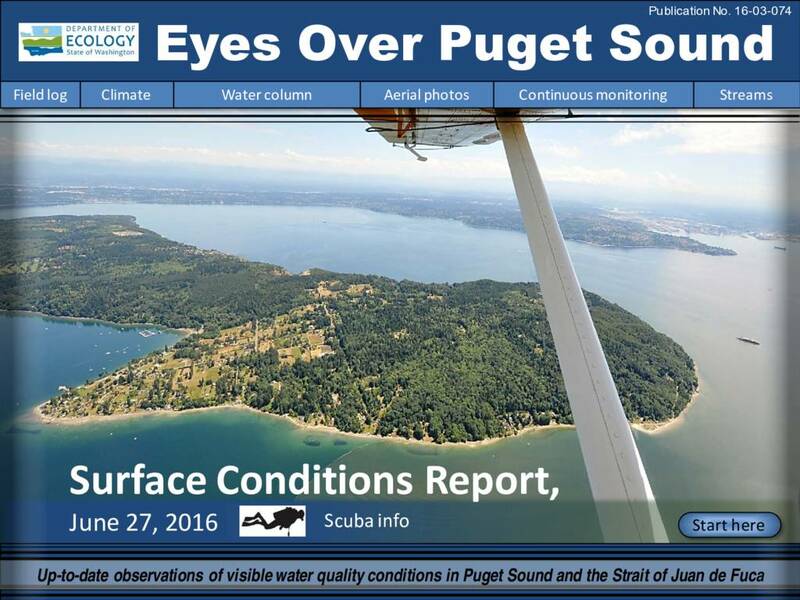 Description Record-breaking warmer and fresher water in Puget Sound. May-June conditions are more unusual than last year. Recent rain brought river flows close to normal but water exchange in Puget Sound remains weak due to low Fraser River flow. Phytoplankton blooms and organic material are visible in some areas of Central and South Sound but not in others. Noctiluca, while absent in Central Basin, was reported in unusual places. Jelly fish occur only in some south sound bays. Follow our BEACH program kick off, discover the Stinkworm, and find good underwater visibility for diving.